Integumen plc (AIM: SKIN) announced today that it has conditionally agreed to acquire Cellulac PLC (“Cellulac”) in an all share transaction, subject to a number of conditions ,including due diligence and the approval of both Integumen’s and Cellulac’s shareholders. The full announcement can be found below. Integumen proposes to acquire the entire issued and to be issued share capital of Cellulac. The consideration will comprise such number of new ordinary shares in Integumen (“Consideration Shares”) as will represent approximately 84% of the issued share capital, as enlarged by the Consideration Shares only. In addition, Integumen intends to raise up to £7.5 million by way of an equity placing and/or debt funding. On completion, it is proposed that Integumen will change its name to Cellulac plc and that the shares in enlarged group will be admitted to trading on AIM. Cellulac is at the forefront of the biodegradable plastic revolution. 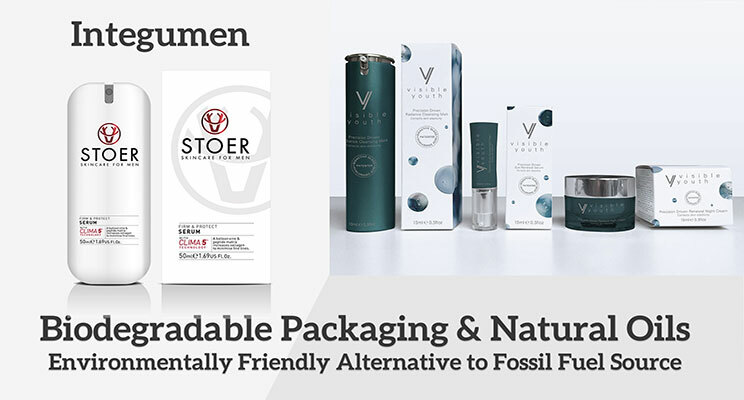 Integumen’s existing personal care business products offer “direct to consumer” access, transforming single-use plastic packaging to Cellulac’s biodegradable green solution. 8 million tonnes of plastic are dumped into the seas every year. By 2050 the weight of plastic will equal the weight of the fish left in the oceans. Government minds are focused on finding a solution because China has refused to take any more of the world’s rubbish since 2017. Until recently Ireland shipped 95% of its plastics to China. Britain’s plastic recycling has dropped because China won’t take it anymore. THIS ANNOUNCEMENT (INCLUDING THE APPENDICES) AND THE INFORMATION CONTAINED HEREIN IS RESTRICTED AND IS NOT FOR RELEASE, PUBLICATION OR DISTRIBUTION, IN WHOLE OR IN PART, DIRECTLY OR INDIRECTLY, IN, INTO OR FROM THE UNITED STATES, AUSTRALIA, CANADA, JAPAN, THE REPUBLIC OF SOUTH AFRICA OR ANY OTHER JURISDICTION IN WHICH SUCH RELEASE, PUBLICATION OR DISTRIBUTION WOULD BE UNLAWFUL. Integumen (LSE: SKIN) announces that it has conditionally agreed to acquire Cellulac PLC (“Cellulac”) in an all share transaction, subject to, inter alia, due diligence and the approval of both Integumen’s and Cellulac’s shareholders (the “Proposed Acquisition”). Cellulac has developed, acquired and integrated technologies to produce biodegradable plastic components for consumer packaging, natural oils and nutritional food ingredients for use in the cosmetics, nutritional food and health care sectors. The Proposed Acquisition will enable Integumen to enter the highly attractive bio-materials and nutritional food sector complementing its existing personal care businesses. The enlarged group will focus on biodegradable plastic ingredients, cosmetics and human grade food supplements and will have a portfolio of existing products, with high-margins in the oral care, medical and cosmetic industries. Existing Integumen cosmetic packaging, oral care consumer products and third party products can in time be replaced with biodegradable plastic materials. These drop-in replacements will be focused on existing and near to market products. Demand for these products is established and an offtake agreement worth up to $36m over five years is already in place. bring a strong well-established management team to the enlarged group. Integumen proposes to acquire the entire issued and to be issued share capital of Cellulac. The consideration will comprise such number of new ordinary shares in Integumen (“Consideration Shares”) as will represent approximately 84% of the issued share capital, as enlarged by the Consideration Shares only. In addition, Integumen intends to raise up to £7.5 million by way of an equity placing and/or debt funding (the “Fundraising”). The Proposed Acquisition would constitute a reverse takeover for Integumen under Rule 14 of the AIM Rules for Companies (the “AIM Rules”) and under the City Code on Takeovers and Mergers (“Code”). Accordingly, under the AIM Rules the Proposed Transaction is subject to the publication of an admission document and approval by Integumen’s shareholders. In accordance with Rule 14 of the AIM Rules, the Company’s ordinary shares will be suspended from trading on AIM with effect from 7:30 a.m. today. The Company’s ordinary shares will remain suspended until such time as either an admission document is published, or an announcement is released confirming that the Proposed Acquisition is not proceeding. The Company will update its shareholders as and when appropriate. Cellulac is a public company with 35 shareholders and, although its shares are not traded on any exchange, it is currently also subject to the Code. However, a non-waivable condition of the Proposed Transaction is that Cellulac will re-register as a private company, at which point it will cease to be subject to the Code. Further details regarding the proposed re-registration of Cellulac as a private company and the operation of the Code are provided below. The Proposed Acquisition will be subject to a number of further conditions, including, inter alia, completion of satisfactory due diligence, amendments to Cellulac’s convertible debt, the entering into and completion of a share purchase agreement, publication of an AIM admission document, the grant of a waiver by the Panel in connection with a Whitewash (as detailed further below), approval of both Integumen’s and Cellulac’s shareholders, and the Fundraising. In conjunction with the admission of Integumen’s enlarged share capital to trading on AIM (“Admission”), the Company intends to perform a consolidation of its ordinary shares and change the name of the Company to Cellulac plc. Cellulac is a vertically integrated group of companies with operations in Ireland and with headquarters in the United Kingdom. Activities undertaken by these companies range from the production of biodegradable plastic ingredients and natural oils to expertise in consumer marketing in cosmetics, food and health care industries. The production division capabilities include process engineering, chemical engineering, biochemistry and polymer science. Cellulac has scaled from 10-litre Omega 3, laboratory scale in 2009 to pilot-scale of 1,000 litres in 2014. This was further expanded up to 10,000 litres in 2015 before moving to commercial scale of 80,000 litres in 2016. Commercial scale batches of Omega 3 oil for human consumption, resulted in operational savings of 25% over conventional Omega 3 production methods. Regulatory approvals were sought and received for the sale of the product in the European Union and the United States. Cellulac’s website address is www.cellulac.com. Upon Admission, it is proposed that Gerard Brandon and Camillus Glover, who are, respectively, the current Chief Executive Officer and Chief Operations Officer of Cellulac, will join the Board as (I) Chief Executive Officer and (II) Chief Operations Officer, respectively. It is proposed that Chris Bell, the current Chief Financial Officer of the Company, will remain as an executive director upon Admission. It is further proposed that an additional two non-executive directors will be appointed to the Board. In light of the above, Declan Service has resigned from the Board with immediate effect and Chris Bell has agreed to act as interim Chief Executive Officer of the Company. On 22 December 2017, the Board of Integumen outlined its commitment to review the product portfolio with a view to setting commercialisation priorities for 2018 and beyond. After considering a number of options the Board determined that it needed to expand its revenue generating activities through product acquisitions to enhance its higher margin oral care, skincare and personal care business and leverage its cost base more effectively. Consequently, pending completion of the Proposed Acquisition and the Fundraising, the Board has decided to continue the promotion of the more significant revenue generating technologies, in the expectation that they have the earliest potential for positive cash-flow. To support this, the Board has approved a cost reduction and cost deferral programme amounting to a saving of approximately £40,000 a month across other areas of the business and corporate overheads. In addition the Company is in the process of undertaking a small debt or equity raise, in association with Cellulac, to pay ongoing transaction costs and increase its financial resources while the transaction progresses. Stoer, the male cosmetics brand, has been progressing sales from existing inventory acquired as part of its acquisition, via new online outlets. Pending further funding, development activities beyond existing products at Visible Youth and Clarogel have been reduced, contract discussions with Champion Shave deferred and emphasis is now targeted on maintaining the Company’s patent and trademark portfolio. The Code currently applies to each of Integumen and Cellulac. As the Proposed Acquisition is conditional upon the re-registration of Cellulac as a private company, upon which the Code would cease to apply to Cellulac, the Proposed Acquisition will not comply with the Code. The shareholders in Cellulac (the “Selling Shareholders”) are presumed to be acting in concert for the purposes of the Code and, if the Proposed Acquisition proceeds, it is likely that they will together acquire more than 50% of the voting rights in the enlarged share capital of Integumen which, without a waiver of the obligations under Rule 9 of the Code (commonly referred to as a “Whitewash”), would oblige the Selling Shareholders (and any persons acting in concert with them) to make a general offer to Integumen Shareholders under Rule 9 of the Code (a “Rule 9 Offer”). Consequently, the Proposed Acquisition is conditional upon the grant of a waiver by the Panel of such a waiver and the approval of such a waiver by at least 50% of independent shareholders in Integumen voting on a poll at a general meeting. A condition to the Proposed Acquisition is that Cellulac is first re-registered as a private company. Accordingly, Cellulac will issue a circular to its shareholders setting out the background to and reasons for the re-registration and calling a general meeting at which its shareholders will be asked to approve the re-registration (the “Re-registration Circular”). If Cellulac shareholders do not approve the re-registration of Cellulac as a private company, the Proposed Acquisition will not proceed and Cellulac will remain a public company. The Code currently applies to Cellulac. If Cellulac is re-registered as a private company, the Code will cease to apply. Cellulac shareholders should note that, if the resolution to re-register Cellulac as a private company becomes effective, they will not receive the protections afforded by the Code in the event that there is a subsequent offer to acquire their Cellulac shares. The Re-registration Circular is expected to be published in the next few weeks and, as well as setting out the background to and reasons for the re-registration and calling a general meeting at which its shareholders will be asked to approve the re-registration, it will include an explanation of the Code and the protections that Cellulac shareholders will be giving up if the re-registration becomes effective. Brief details of the Code and the protections given by the Code are described below. Before giving consent to the re-registration of Cellulac as a private company, Cellulac shareholders may want to take independent professional advice from an appropriate independent financial adviser. The Code is issued and administered by the Panel. Cellulac is a company to which the Code applies and its shareholders are accordingly entitled to the protections afforded by the Code. The Code and the Panel operate principally to ensure that shareholders are treated fairly and are not denied an opportunity to decide on the merits of a takeover and that shareholders of the same class are afforded equivalent treatment by an offeror. The Code also provides an orderly framework within which takeovers are conducted. In addition, it is designed to promote, in conjunction with other regulatory regimes, the integrity of the financial markets. The Code is based upon a number of General Principles which are essentially statements of standards of commercial behaviour. These General Principles are set out in Part 1 of Appendix B. The General Principles apply to all transactions with which the Code is concerned. They are expressed in broad general terms and the Code does not define the precise extent of, or the limitations on, their application. They are applied by the Panel in accordance with their spirit to achieve their underlying purpose. In addition to the General Principles, the Code contains a series of Rules, of which some are effectively expansions of the General Principles and examples of their application and others are provisions governing specific aspects of takeover procedure. Although most of the Rules are expressed in more detailed language than the General Principles, they are not framed in technical language and, like the General Principles, are to be interpreted to achieve their underlying purpose. Therefore, their spirit must be observed as well as their letter. The Panel may derogate or grant a waiver to a person from the application of a Rule in certain circumstances. This announcement is made with the agreement of Cellulac. Announcements made by Cellulac in connection with the Proposed Acquisition will be made on its website at www.cellulac.com. In accordance with Rule 26.1 of the Code, a copy of this announcement will be available on Integumen’s website at www.integumenplc.com and on Cellulac’s website at www.cellulac.com. The content of the websites referred to in this announcement is not incorporated into and does not form part of this announcement.